A triathlon is a competitive sport that integrates three different high intensity sports into one- swimming, biking, running. To enhance performance, sports nutritionists and exercise physiologists recommend that tri-athletes maintain their ideal weight through a strict and well-planned nutrient dense diet that is high in carbohydrates. This can coupled with a daily intake of multivitamins. Women tri-athletes need to increase their iron intake. Before competitions, tri-athletes need to taper intensity training and their carb load. Half an hour to an hour prior to exercising, a pre-practice or pre-workout protein and carbohydrate snack should be consumed. Take lots of fluids while exercising to prevent heat-related illnesses and dehydration. In addition, one can further enhance the performance of tri-athletes with the aid of sports supplements. These man-made ergogenic (energy producing) supplements can aid in providing strength and power. Generally, these supplements provide what the tri-athletes need such as electrolytes, water and carbohydrates while under strenuous physical activities. In addition, these supplements have been known to potentially increase the exercise capacity and tolerance of the body, resulting to longer and more intense training. Energy Drinks - As opposed to sports drinks, energy drinks are not isotonic and simply provide tons of caffeine and sugar for an energy boost. Carbohydrates - It is imperative for tri-athletes to consume large amounts of carbohydrates in order to maintain carbohydrate stores in the muscles and liver. In addition, eating a small amount of protein before the exercise can increase the availability of carbohydrates, thereby leading to enhanced performance. Water and Sports Drinks - Significant fluids, in the form of sweat, are lost from the body while exercising. The loss of too much body fluid can lead to heat-related illnesses such as heat stroke and dehydration. In order to prevent heat-related illnesses and thus maintain optimum exercise performance, one needs to drink lots of water or sports drinks frequently. This will ensure that no more than 2 per cent of body weight (in the form of liquid) will be lost. Sports drinks such as Gatorade, Powerade, and Accelerade are ideal for endurance athletes because they contain carbohydrates and salt. Sports drink not only rehydrate, but replenish the body with much-needed nutrients, sugar and electrolytes. Creatine - Creatine remains to be one of the more popular supplements for tri-athletes because it increases muscle strength during training. 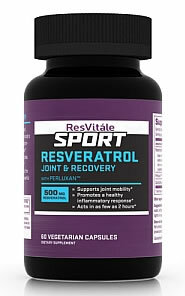 Sport Resveratrol Antioxidant Formula for Joint & Recovery: Buy Now! Sodium Phosphate - Numerous studies show that sodium phosphate can increase maximal oxygen uptake. Sodium Bicarbonate - Also known as baking soda, sodium bicarbonate gets rid of carbon dioxide and acidity by buffering these toxins with bicarbonate ions before being expelled through the lungs. Sodium bicarbonates prove effective in improving exercise capacity especially when swimming. However, bicarbonate loading can cause gastrointestinal distress in some people. Caffeine - Caffeine is a natural stimulant found in tea, coffee, chocolates, soft drinks and energy drinks. Taking caffeine before exercise can improve exercise endurance capacity. Glycerol - Studies support that the ingestion of glycerol with water can significantly increase fluid retention, thus preventing dehydration especially during prolonged exercise. However, glycerol has not been proven to increase exercise capacity. In addition to these widely popular performance-enhancing supplements, other substances believed to enhance performance among tri-athletes include Essential Amino Acids or EAA and HMB. In addition, improving the immune system of is important and thus the intake of immune system boosters is recommended. Possible nutrients, which boost the immune system, include zinc, vitamin C and Echinacea. The intake of these supplements may prove beneficial in enhancing performance, but bear in mind however, that these products are just supplements, and are not meant to replace a balanced diet. And always remember to consult an exercise physiologist and sports nutritionist to ensure that these supplements are suitable for your body. Over dosage of some nutrients could lead to grave results. It�s always better to be safe than sorry.